Shawn Smucker, a middle-aged father of six who drove for Uber and Lyft when writing was slow, wanted to help the Syrian refugees. Writing a book about their situation was a way he was uniquely equipped to help them, so Lancaster’s Church World Service arranged for him to meet a Syrian refugee named Mohammed. When Shawn, through a translator, discussed his book idea with Mohammed, stressing that book writing and publishing are no sure thing and that nothing might come of this attempt to help, Mohammed’s reply shook Shawn’s life. So he forged on, helping Mohammed, his wife, and their four sons and, unexpectedly, receiving more than he gave. He learned about friendship, about just sitting peacefully together, about caring for each other, and about deliberately intertwining busy lives. He realized that we have almost no time for the people in our communities who need a place to sit and talk. And he put his finger on a basic problem of North American society. When Mohammed told his wife, “I will start having coffee with people. Soon everyone will come to my house and we will all know each other and talk together,” she pointed out that Americans do not want this, and she may be right. In a society where many are too busy for friendship and people constantly move further apart, we need more of the culturally foreign idea that friendship—just hanging out and having coffee, simply dropping by to see each other—is so valuable that it should be prioritized. Meeting the kind and optimistic Mohammed was life changing for Shawn who wrote, “My deep-seated, hidden concern that every Muslim person might be inherently violent or dedicated to the destruction of the West was exposed and found to be false.” Of course it was false; no large group of any people have ideas so homogeneous, especially not if they have families. And, as often happens after an epiphany, Shawn jumped from one extreme to its opposite, now suggesting that maybe, possibly, there could perhaps be one bad apple in the 60,000 refugees entering the United States. However, all other matters aside, there are many more than just one bad apple in any large group of people—just visit any community of that size and ask the local police. First of all, I found it incredibly sad that a Christian, one whose life is to be characterized by love to God and others, needed to learn about friendship from a non-Christian. This is so ironic! There is something wrong with our North American society, our busyness, our independence, our self-sufficiency, and our inability to overcome personal anxiety to reach out to others. Other cultures—Middle Eastern and, in my personal experience, also Asian and South American—seem to understand friendship in ways we do not. We have much to learn from them, and this story of Shawn and Mohammed shows that clearly. Furthermore, this lack of experience with friendship and community hugely affects our ability to tell people about the Lord Jesus and what he has done for us. I am very sad for Mohammed and other Muslims whose Christian friends do not tell them about Jesus. Yes, believe me, that can be a complicated process, but it is possible and should at least be attempted, not avoided as hopeless. After all, with God all things are possible. Finally, there is something wrong with the way we live our faith if we gratefully learn about human interaction from others but do not tell them about Jesus. Is it that we do not care enough about them to be concerned about their eternal welfare? Or that we do not know enough to be able to do so in an helpful way? Or is it that we really do not consider the gospel important enough to share? These are all things we need to consider, as individuals and as churches. 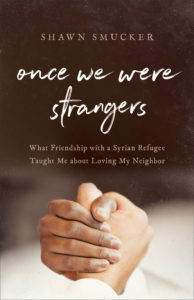 Shawn subtitled his book, What Friendship with a Syrian Refugee Taught Me about Loving My Neighbor. Yes, he learned a lot, and I am grateful for the way his book reminded me to prioritize friendship. But I hope that he, and we all, will also learn in a deeper way that really loving our neighbors also involves letting them know the incredibly good news about Jesus. Because that, after all, is more important than anything else. Isn’t it? In Off the Clock, Laura Vanderkam shows us how to find space for relationships in our busy lives and also demonstrates that doing so will actually make us feel as though we have more time. If you enjoyed this review, you might want to friend me on Facebook where I occasionally show up, or connect with me on GoodReads where I eventually share what I read. This may be linked to Saturday Reviews, Booknificent Thursdays, 52 Books in 52 Weeks Challenge, Literacy Musings Monday, and The Book Nook as well as to Inspire Me Monday, Christian Homemaking, Friendship Friday, Make My Saturday Sweet.